I have now seen Godard’s first two films and if one thing can be said about them, they are most certainly original and demonstrate a unique voice in cinema. Many, however, will certainly be off-put by that style and likely hate these films and label them as pretentious garbage. And it is hard to see these films and not see how they have helped carve that mindset in the general consciousness towards films labelled foreign or arthouse. That is not to say these films are actually bad. Quite the opposite in fact. They may actually be brilliant. Probably are in fact. Godard is a brave filmmaker. I’ve rarely seen anyone defy convention as deftly as he has. He sets out to make his film with the imagination and fervor of an excited child and cinema is, to put it simply, his playground. One need only look up famous quotes from the man and see he is a rambling mess of ideas spewing around, sometimes in contradiction but often interesting. These are his films. They are a non-linear messes of style, theme or lack there of, but have been completely fascinating. 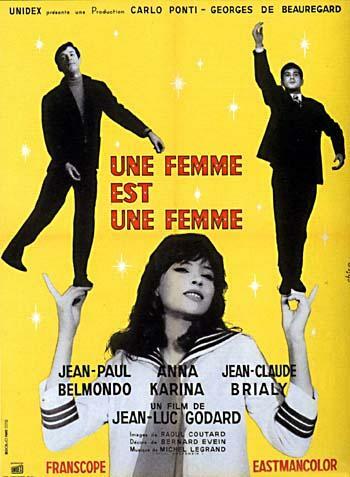 For A Woman is A Woman, Godard has reeled his style in somewhat. It isn’t quite a disjointed as Breathless, and has a somewhat more approachable plot. A stripper wants a baby with her distant boyfriend. Meanwhile, his friend quietly chases her trying to convince her he loves her. Despite my proclamations of it being “reeled in”, that is not to say that Godard doesn’t barrage the viewer with bizarre edits (often which seem to be missing vital chunks of the film), random audio drops, text that slowly checks out across the screen, peculiar shot choices, and semi-frequent fourth wall breaking. I am not sure I have gleaned much of if any of the meaning of these techniques other than Godard proving that he can, and perhaps that’s all I’m meant to take from them (I am somewhat new to French New Wave so I’d love some comments on the matter), but here is something to be said: I was never bored and was often amused, such as when actor Belmond mentions being friends with Burt Lancaster and breaks the wall in a too amusing grin. With all of the stylistic bombardments, I would say that the biggest success of this film is the emotional truth it manages to capture. Relationships are complex, messy, lack a clear message and can be funny, upsetting, depressing, but ultimately validating. The style mirrors the state of mind the characters are in. It’s a flurry of situations and feelings and Godard captures it admirably. It is easy to view this film as coping with feminism and gender identity, but it’s hard to really get a grasp as to what he is saying about that, if he’s saying anything substantial at all. The protagonist Angela doesn’t really know what she wants. She’s an object of desire but has power over the men in her life. Perhaps the film is merely about her quest to find an identity through a child. Who knows. I’d love to hear everyone’s thoughts on the matter. I would also like to mention that Anna Karina is very beautiful. Final Word: It’s not a film for every one. If you don’t want to watch something that may seem experimental, strange and silly quite possibly just for the hell of it, then don’t watch it. But if you’re open minded to that give it a go. I don’t think you’ll regret it. I didn’t. A very good film, but I preferred Breathless. This entry was posted in Comedy, Drama, Old Releases. Bookmark the permalink.